Shane is very good at showing and describing the motions needed to operate VoiceOver + the strengths and limitations of the tool. Awesome work Shane and thank you. On the iPad - I noticed that some sites had a Reader button appear in the URL. Click on it - and it becomes text. I wonder if there are other accessibility settings in here? Maybe VoiceOver? ---------- I set up VoiceOver, showed him how it worked, and handed Dad the iPad. Well, this looks more promising, Dad said as he put the iPad to his nose and squinted to see the screen. Typing, however, was still slow and awkward. Not sure how well this is going to work. ---------- Wendy - did you think about using Siri?My brother is also in the IT space. He has occasional flashes of genius. This was one. I scampered back to the iPad. Can my father draft an email without having to type it? My answer....kinda. I still need to figure out how to delete incorrect text in a way that isn't so frustrating. Furthermore, besides reading and writing emails, is there some way to make my Dad more independent? Not so reliant on Mom to get out and about? As it stands, Dad is still trying to maintain his old normal in hopes that the scheduled surgeries give him his eyesight back. That's part of the process. One of the lessons learned is that people will learn what they need to know when they are ready. Meanwhile - this buys me some time to figure this whole issue out. And pray that we never need to use any of this information. For 50 years, Dad has been blind in one eye. For 25 of those years, he's seen nothing at all out of that eye. No light, no shade, nothing. A month or so back - he noticed something in his good eye. A leisurely Friday trip to the doctor turned into a month of bright lights, lasers, fog and tendrils drifting through his vision. The retina in his good eye was starting to let go. His good eye is weak from doing the work of two eyes for the past 50 years, so recuperation hasn't gone as smoothly as any of us hope. Thankfully, he is getting his sight back. There is still a long way to go and we're not entirely certain how permanent this fix is. The thought of my Dad becoming functionally illiterate if things go wrong scares the heck out of me. He's put up a good front, and has engaged in more than a little denial, but I know he's scared too. Right now - we have a chance to come up with a back-up plan. Dad currently has vision enough to read (albeit uncomfortably) and learn a new tool. Time to strike while we still have the chance. One of the benefits of a formal instructional technology education is exposure to assistive technologies. I haven't had to take a look at the state of the field in a very long time (like 7+ years). My Dad is an Apple fanboy. However - he's of the "buy once and use until death" school of IT. He had his Power Computing desktop for over 10 years before he finally had to break down and buy a new tower a few years ago. My first thought was to use Mac OS 10.6.x built in accessibility tool - VoiceOver. This sighted person could not figure out how to get the thing to work the way I wanted it to with the control I would like - even being able to SEE the screen. I am not the only one (read the comments). Really awkward multi-finger keystrokes are required. Might be OK for a kid (or me). Very awkward for a 70+ year old - even with decent dexterity. There also didn't seem to be any way to integrate voice commands with the technology. I had Dad try out the solution. He (rightly) rejected it out of hand. How do they expect me to use this if I can't read my keyboard? How indeed. The example used in this post is taken from my new and improved scenario design webinar. It’s a one-hour online workshop you can request for your team or ASTD chapter. I’m also developing a 4.5-hour scenario design mini-course that anyone can sign up for. We’ll meet online for three 90-minute sessions starting this fall. If you’d like to be notified when the online course is available, please sign up here and you’ll be among the first to hear about it. Marketers and trainers have the same goals: They want people to do something. But they achieve those goals in vastly different ways, and I think marketers often do it better. Let’s look at some techniques we can steal from a successful marketing video. 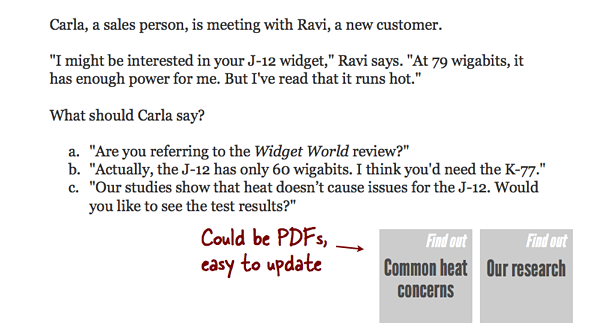 This post includes two embeds that probably won’t appear if you’re reading it through email or an RSS reader. I recommend you view this post in the blog. Here’s our role model, the immensely popular commercial for the Dollar Shave Club. Not allowed to watch YouTube? Watch the same video here on Vimeo. Put on your headphones — inappropriate language is bleeped out but could still offend. The video was so effective that the influx of traffic knocked the Dollar Shave Club site offline. The commercial has been featured in several publications as an example of highly effective, low-budget marketing. What does the Dollar Shave Club guy want us to do? He wants us to go to his site and sign up for his service. Let’s look at how an instructional designer might try to inspire the same action. Here’s the training version, without audio. Many elearning developers would have a narrator read the screen to you, but I couldn’t make myself do it. What does the Dollar Shave Club guy do differently? Here are just a few differences. The Dollar Shave Club guy uses a fast pace, he mocks other commercials because he knows we see them as dumb, and he lets us draw conclusions rather than telling us everything explicitly. He says, “I think you’re smart,” and that makes us like him. The training version plods and spoon-feeds us predigested information. It doesn’t let us draw any conclusions on our own. It says, “I think you’re dumb, so dumb that I have to lead you by the nose through the most basic of information.” Who wants to be told they’re dumb? The Dollar Shave Club guy really is the Dollar Shave Club guy. He’s talking about his business. He’s also an underdog in the world of shaving products, and we tend to root for underdogs. Who’s the person behind the training version? There’s no one there. It’s the tiresome Omniscient One, the faceless, personality-free voice of the nobody who knows everything. It’s no underdog, it’s Big Brother. The Dollar Shave Club commercial is one huge surprise filled with many smaller surprises. Big surprise: “This can’t be a real ad! Wait, it is!” Smaller surprises: Everything else. The training version, like most training materials, has zero surprises. It’s a dry, predictable conveyor belt of dry, predictable information. You or your stakeholders might already be saying the following. “But we’re not selling anything. The comparison is unfair.” Marketers want to inspire a specific action. It can be “Buy the razor,” but it can also be “Sign up for our email list” or “Test drive our car.” Just like marketers, we want people to do something. We want them to encrypt emails, use the 5-step Difficult Conversations model, stop standing on chairs to reach high shelves… Marketing has tested a bajillion ways to get people to act, and we should steal the good ones. “Obscenities are a low form of humor and we could never use them.” I’m not suggesting you use any obscenities. I’m suggesting you look at the larger picture, such as the three ideas listed above that separate lively marketing from conventional training. What do you think? What ideas can we steal from marketing? Do you know of any elearning that applies any of these principles? Let us know in the comments! If you thought the commercial was funny and would like to use humor in your materials, you might like my post How humor helps.